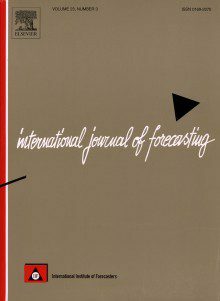 The International Journal of Forecasting (IJF) is an official publication of the International Institute of Forecasters (IIF). Published quarterly by Elsevier, its objective, and that of the IIF, is to unify the field of forecasting and to bridge the gap between theory and practice, making forecasting useful and relevant for decision and policy makers. We are currently looking for an editor-in-chief (EiC) to provide the International Journal of Forecasting with outstanding leadership. The candidate will have an excellent understanding across the breadth of the forecasting field with an exceptional research-based track record in both theoretical and applied dimensions. The candidate will be committed to the development of the journal as a world-leading publication of the IIF, drawing on their past editorial experience. Click here to review the complete job description.